I’ve spent just short of decade now engaging with extremism. During that time Religious Extremism has become a very important topic. Too often the definitions placed on it do not demonstrate an understanding of how faith works in people’s lives. I’m very concerned about extremism wherever its found, but I’ve come to the conclusion that as a Christian I’m best placed to put meaning on what Christian extremism looks like. Its sometimes uncomfortable holding a mirror up to yourself and the faith that means so much to you. In challenging extremism I’ve valued the support of Hope not Hate. I recently wrote a piece for Hope not Hate’s State of Hate 2019 report, You can download the whole report here. Director of Hope not Hate Nick Lowles opened up the topic in the report with an essay “Understanding and Countering Extremism” (p101-11). He usefully gives six characteristics of extremism that it are vital we think about as we look at religious extremism. Alongside my own perspective piece is another by my Sikh friend Gurinder Singh Josan (p12) that highlights many similar themes. I hope my own piece read in the context of these can help us come to a better understanding of religious extremism. On 10th March 2009 I met extremism face to face on the streets of Luton. As the group that became English Defence League confronted members of al-Muhajiroun the raw hatred was tangible. Over the ten years since that time we’ve faced a lot of extremism in our town, but it has been hatred, the strongest symptom of that extremism, that has too often poisoned the atmosphere, its corrosive presence seeking to eat away at the heart of community relationships. Antifascist groups like Hope not Hate have long successfully sought to challenge political extremism, but the religiously motivated extremism that bust into popular consciousness in September 2001 has provided a different challenge. Both far right and Islamist terrorism have played to the script of a clash of civilisations, portraying their cause as inevitable when western Christian / liberal civilisation meets Islam. They have too often plundered history for its stories and icons, restating their case and with it justifying the most awful crimes. As a community mediator and peacebuilder based in Luton’s town centre parish church and working across the community I have worked closely with churches and mosques to challenge this narrative. We have sought to bring the perspective and teachings of our faiths to challenging religiously motivated extremism, and the hatred it generates. My Muslim friends quickly convinced me that the attempts of al-Muhajiroun and others to claim the moral high ground of Islam were not true to the Qu’ran or the mainstream scholarship of Islam. Their sincerity, commitment to challenge those in their midst who held to a different view, and most importantly their friendship, have made it easy to reject the idea that al-Muhajiroun, al Qaeda and ISIS represent Islam. For our part it was relatively easy for us as Christians to dismiss the claims of EDL or the BNP to represent the Christian heritage of our nation. However when Britain First’s “Christian Patrol” appeared on our streets with their large crosses and professed “righteous anger” at what they claimed was happening to Luton we had to fine tune our message. When they announced plans to march in Luton in June 2015 church leaders in the town wrote to them challenging their plans. Three of us met with them. We heard of faith journeys that sounded convincing, all too like some of our own, and statements of faith we could superficially share. Yet at the heart of their words in that meeting was a lot of fear and hatred, and what was lacking was love. It made me hold a mirror up to the way I expressed my own faith. Genuine faith, whether Christian or Muslim, or that inspired by other faiths, is not at its heart about an ideology that leads to extremism and generates fear and hatred, but the outworking of that faith in peoples lives as love and service. An arson attack on a mosque in early May 2009 concentrated our minds as churches and mosques as to how we were going to face down the hatred and resist the attempts of the extremes to pull us apart. There has been a lot of work done in Luton, and as faith communities we have been a central part in all of it. However for me the key piece was a statement made at a press conference covered on national TV where we said we would not allow religious extremism to be at the heart of Luton’s story, but rather love and service. Its certainly very easy to attach the label extremist to people of faith. It sometimes feels that anyone with a conservative approach to interpretation of faith is fair game. Yet across Luton I can point you to deeply committed Muslims and Christians, conservative in their faith, who have been at the heart of the community’s commitment to living at peace. That is simply because they know the faith they take seriously calls them to love. And so they reject hatred with their whole being. My tentative working definition of religious extremism is “Faith inspired ideology without love.” Does that work for you? I appreciate your (polite and serious) comment. On Monday I read the story of Mexican migrant children being separated from parents when they were picked up by US border patrol. There is even an account of a 6 year old blind boy torn from his mother's arms. Inhuman behaviour by government agencies that should shock us. Lest anyone think I'm singling out the USA its only weeks since Windrush Generation scandal put stories in the news of the shameful deportations of fully legal Caribbean migrants to the UK. Government policy dictating that illegal immigrants face a hostile environment soon meant that even legal migrants faced the same hostility. "Deportee" is a simple yet profound metaphor of the value ascribed to those we choose to devalue, dehumanise, to other. A story from 1948 highlighted the horrible inhumanities still being done by our governments today. This provokes me to anger at many levels. I personally believe in the place of contemporary prophecy in the church. For all the abuse of the form that clearly takes place under that banner, it is entirely appropriate to believe that a God who spoke in the past can still speak now. Yet the Bible calls us to judge prophecy. `At the heart of that must surely be the question, does this sit with Biblical values and truth, surely an obvious question when the Bible is packed full of calls for us to live righteous and just lives. While not all prophecy need emulate the form or content of the the Old Testament prophets, surely that testimony must provide a plumbline for Christian living and the focused word of prophecy that sometimes empowers that? However I find very little of it in much so-contemporary so-called prophecy, and rather more political expediency. The Trump presidency makes a mockery of Biblical calls to seek the welfare of the poor and needy, to give home to the refugee, to protect the vulnerable and the young, to oppose injustice. And the Trump Prophecy must surely be an absolute travesty of Christian prophecy? In contrast i find the protest songs and the singer activists of the 1960's and today, of which Joan Baez is an exemplar, to be packed full of a biblically inspired or at least endorsed call to peace, justice, truth and mercy. I don't even pretend Baez is a Christian, but her causes are surely deeply rooted in the historical Christian social justice agenda than those endorsed in The Trump Prophecy? Baez's (first) encore was "Imagine there's no heaven, it's easy if you try." The song famously protests the evils of wars fought in the name of religion, of greed and injustice, of people caught up investing in eternity rather than the here and now. I protest those things too, and I believe that many experiencing the US Presidents policies being endorsed by so called prophecy will do so too. We believe we are one body. In Christ, there is to be no oppression based on race, gender, identity, or class ... Therefore, we reject misogyny, the mistreatment, violent abuse, sexual harassment, and assault of women that has been further revealed in our culture and politics, including our churches, and the oppression of any other child of God"
Its a great statement, and it did make the news when 2000 attended a service last week and lit candles opposite the White House. However we need such statements in resounding in the soul of the nation, and song does that. Joan Baez's and other topical songs and causes rooted in this tradition that date back millenia to the Old Testament prophets are not just protest songs, they are prophetic songs. May others rise to fill the huge space that Baez and others of that generation have occupied for six decades. Some like Pete Seegar have already sadly been lost to us, Baez at 77 seems determined to carry on, despite the Fare Thee Well Tour title, and clearly has the voice for it! And wouldn't it be nice if some contemporary hymns and songs were in prophetic - and protest - tradition? After the widespread criticism of government counter terrorism strategy, Prevent, designed to support people at risk of joining extremist groups and carrying out terrorist activities, it was really important they get this right. While intended to look at all forms of extremism it is vital that the Muslim community felt it could engage with confidence with the commission process. The response from that community suggests Sara will not be able to effectively engage widely enough. The Muslim Council of Britain were clear that it was unhappy with Sara's appointment: "one of the tasks of the commission would be to define already contested notions of extremism. ... this appointment indicates that the task will continue to be elusive and divisive at a time when the fight against terrorism requires common purpose and partnership." On Prevent, calls for an independent review have been loud and consistent, not least from the Luton mosques. As a result of this a large number of Christian leaders in Luton wrote to address the policy from the church's perspective. While Prevent was initially focused towards Preventing Violent Extremism (PVE), in its most recent forms the Prevent strategy has become focused on the pathway to terror. Meanwhile over the last three years the government widened its efforts to address all extremism. A Counter Extremism Strategy was released in October 2015, with a core thesis being an escalator between religious conservatism and jihadism / terror. The understanding of religious extremism proposed has been widely criticised, not least by Christian groups, who claim it fails to understand the nature of conservative approaches to faith, confusing conservatism with extremism. Muslims reject it for exactly the same reason. The extremism policy was closely followed in late November 2015 by a government consultation on “Out of School Educational Settings”, that would require registration and inspection of all out of school educational contexts over a certain time threshold. This was designed to regulate Madrassas but would also impact Sunday Schools, church holiday clubs etc. This was again criticised widely, as were following attempts to progress their agenda. Finally in the midst of a summer in which we saw four terror attacks they announced in the June 2017 Queens Speech a Counter Extremism Policy, with its major task setting up a Commission. I am not against a Counter Extremism commission. I want it to succeed. But we need an informed and measured view of extremism. It must be applicable to all forms of extremism. It must seek multi-factorial models of radicalisation, and recognise a one size fits all response model will not work. And it must engage intelligently with faith. If it is to understand what drives people of faith to extremism and terror it must understand faith. “The Archbishop of Canterbury has said the Government has "no grip" on what it is to be religious and "can't see really the difference" between Muslim extremist groups and those from the conservative evangelical wing of the Church of England. …. He said that he had once told a senior minister that he would himself count as a religious "extremist" under the definition being applied because he believed that faith could outweigh the rule of law in some circumstances. …. Our Government generally, is desperately trying to catch up, to understand a world in which they have no grip on what it is to be religious at all; where religious illiteracy is prevalent and extremely destructive of understanding and where they can't see really the difference between an extremist Muslim group like the Muslim Brotherhood and a sort of conservative evangelical group in a Church of England church," he said. "They assume they're a bit bonkers." He added: "It's fine to reject and condemn many of the things done in the name of religion but you still need to understand what it is that can so catch hold of someone that they think life itself is not worth living if that contradicts what they believe." "It's extreme to try and tell religious groups what they can and can't teach under the guise of fundamental British values. It's extreme to threaten to send Ofsted inspectors into churches if they don't teach British values. This government's trying to fight extremism with extremism and the main casualty will be our fundamental freedoms." The EA have really been looking at this issue. They conducted research following the June 2017 Queens Speech on the public's views of extremism: What Makes Someone Extreme. Over half over the public (54 per cent) said 'extreme' is not a helpful term to use in social and political discussions, throwing into doubt the viability of the government's plans to create a Commission on Extremism. .... Extreme has become a way of labelling ideas and people that we don't agree with and don't think should be able to articulate their opinions with the same freedom as others. In conflating violent action, and speech which incites that, with opinions we disagree with, we risk ending up with an overly sanitised and ultimately unhealthy society. In a further article they suggested Four things that would be more helpful than a commission for countering extremism. Two of their suggestions are of importance here: Promoting Religious Literacy, and Fostering Good Disagreement. If we are to have a commission perhaps its chair could note these two factors in their selection of other commission members, their selection of those to give evidence. their process as a commission, and their final report. It is critical that the commission include, hear from and give place in their final report to religious conservatives - Christian, Muslim and other faiths. I have chosen not to focus here on Sara Khan as chair, but the Commission she leads. It can still be successful though she has a lot of work to do to build the confidence necessary for that. It would have been easier with a different lead commissioner but I suspect we are now where we are. We wanted to give you an update in how things are in Luton since you've always expressed concern at the state of the church here. Since you can't come to Luton just now after your own venture here in January 2016, Holy Week seemed a good time to write. I'm writing over a coffee after returning from our Luton churches' Good Friday walks of witness through different parts of Luton. It was my privilege to to join the churches in Bury Park in carrying the cross along the main shopping street there. Five other similar walks took place around the town, including that through the town centre ending up at my own church, St Mary's. Hundreds of local Christians took part in the various walks. We know you're interested in Bury Park so let me tell you more of that walk. We visited five churches, and members of several other churches took part. As we walked along the main street we were greeted by lots of local shop keepers and shoppers, Muslim in the majority. It was a quieter walk than last year when after your own visit, local Muslims were especially keen to greet us. In fact they organised to meet en route to distribute candles dedicated to peace. It was deeply moving. I wrote about it last year, you may have read my account here. .
Back to this year - at each stop a part of the gospel account of Jesus' journey to his death was read. On a couple of occasions we prayed for those suffering for the sake of their faith. And it was very moving outside the church in the heart of busy Bury Park to hear the Gospel message clearly spoken out. At the last church, inside in this case, we heard a challenge to hope in the face of death, knowing that it's the Christian message that Good Friday always leads to Easter Sunday. The Cross in Bury Park. You see, it's our experience that we can live, work, and importantly worship and preach as Christians here. I'm not pretending it's always easy. To claim that would help no one. But we are with talking about the challenges with our Muslim friends, and the authorities, and they are slowly being sorted. But when it comes to Good Friday we can carry the cross through the town as we have always done. Town Centre Walk of Witness passes luton Crown Court. I guess the difference is we carry the cross a bit differently to you. I've been watching the way you've been working in Sparkboook Birmingham this week, and remembering your own so called "Christian Patrol" here last year. Your actions seem to provoke people's angry response. I'll not try to tell you why, but I would ask you to think about it. I still remember Jayda's words in a video recorded after you met with us early June 2015 which went something like this: "The Christian leaders in Luton told us they tried to live at peace with their neighbours, even when they were Muslims. How can you live at peace with people who want to kill you?" I know many many Muslims, some very well, and none have expressed a desire to kill me. (The closest they come to it is by overfeeding me with their hospitality. Call it 'food jihad' I guess.) The reason I mention that is that it seems to me we have very different views of what we can expect from Muslims. And that leads to very different experiences as we meet them. And very different styles of engagement with them. Worship outside St Marys Church, Luton town centre. The cross to me is not to be thrust in people's face, to be used agressively and divisively. Yes, it has been used in the past as a symbol of conquest, and become associated with violence, destruction and death. But those things are far removed from its true meaning of sacricial love, of forgiveness and of life. Yes, it is a point of division from our Muslim neighbours. But when they're prepared to greet us as we carry a cross past their mosque it shows those differences can be overcome for the sake of good neighbourly relations. Tempted as I am to continue I am not here to preach to you, but to let you know how things are. So I'll stop here. I will finish by reminding you of what churches across the U.K. had to say to you after your Luton visit last year. Britain First Denounced By Every Major Christian Denomination In The UK. Let me ask you to reconsider this Easter how you represent the cross, especially in Birmingham. We are praying for you. Who deserves first place in the persecution stakes? The Atlantic recently had an article titled "The Evangelical Perecution Complex: The theological and cultural roots of a damaging attitude in the Christian community." I think it had a point in suggesting Christians view of opposition is rather too shaped from their long history of being the powerful in society, and the world. "Believers can come to see victimhood as part of their identity." It's an important subject for Christians today of all days. So I was interested when this morning I was greeted with two stories on Facebook, posted by several friends. Some were posting Lord Carey's article in the Telegraph where he argues that as Christians are “disproportionately” persecuted in the Middle East they should be given priority for help from the British Government. there were similar sentiments expressed on the floor of the Canadian Parliament. Candice Bergman MP noted that we don't often hear of Hollywood stars speaking out for Christians at the Oscars, and that in fact "many of the elite readily join in the mockery and disdain shown to Christians." I'm wary for several reasons of the rush to join the ranks of the most persecuted group on earth. First it may be true. Or It may not be. So many are dying at this time. So much intra-faith persecution and slaughter goes on in the Middle East at present I'm really unwilling to say who gets the worst deal. Certainly Christians are having a very hard time. So too are Sunni Muslims. So too Shia. So too Yezidi. And many many more. Second, I fear a mindset of "I'm more victimised than you." And the resulting victim mentality. It's debilitating for those who fall into it. But thirdly on today of all days it seems to ignore the attitude of Jesus in the face of abuse, a prejudicial trial, and facing a violent death. i can't speak personally for those suffering. I pray for them, for grace and strength whatever they face. For myself though I seek to cultivate an attitude of solidarity with all around me - Christian, Muslims and all. I think that's part of being a global citizen.and it's a lesson from the story of the good Samaritan. I'm convinced Jesus gives me the grace to seek the good of all. Marwan it turned out was Marwan al-Banna, and he was a member of Abu Nidal, one of the major terror groups active in the 1970-80s, run by his cousin Sabri al-Banna. Marwan was a signed up member, his life committed to fighting for the Palestinian cause. It's very easy to totally “other” the terrorist. To categorise them in a way that is so different to us, where their evil actions bear no relationship to our own lives and choices. To dehumanise them. To demonise them. They are evil and that's it. It's a very understandable process, but I’m not sure it helps us move forward. "Khalid Masood was a violent Christian [known as Adrian Elms or Adrian Ajao] long before he was a violent Muslim." Those were Baroness Sayeeda Warsi's words on the Andrew Marr show on BBC this am. In other words he was a violent person. He may have used religion to justify violence, but so have many Christians. What lay at the root of his violent nature? It wasn't long after the identity of Khalid Masood became known that the early years of Adrian Elms or Adrian Ajao were uncovered. The account in the Telegraph is as good as any.. Details are unclear and vary somewhat between news stories, but what is clear is that it was a deeply disturbed man who became a Muslim while in prison. He had at least two periods in prison in the early 2000's for violent assault. It was suggested by his defence barrister that one of these assaults was provoked by racism: "There were racial overtones in the argument between himself and the victim. He let that get to him - unusually, because in the past he has been able to shrug off that sort of abuse." The judge's words in sentencing him are important: "While [the racial abuse] doesn't afford any excuse for your behaviour it may afford some degree of explanation." There was the inevitable questions on Friday about what Masood did during his year or do in Luton. For me a different question was at the fore, relating to life four decades earlier. Masood grew up in Tunbridge Wells, a very respectable town, and very white, even today. I know. I grew up there too. My extended family lived in villages on the Kent Sussex border where he lived. I went to a school just up the road from him. I had cousins at his school at the same time as him. There were a handful of black families in the town then, I knew children of two of them. I remember the abuse as I walked occasionally with one, a friend from church. And I remember my shock at the correspondence in the local paper when two East African Asian families arrived in town as refugees in the early 1970s. It's very sobering to reflect on how the threads of my life have come close to Masood's and may even have crossed his. As one Muslim friend said to me on Friday, "Maybe you went to the same church?" In the circumstances that question is a fair mirror of the guilt by association that is so often clear if you happen to have prayed at the same mosque as a terrorist. If racism was a cause of Khalid Masood's angry outbursts it's unlikely to have had its impact overnight. I want to at least ask the question, how much was the foundation of it laid in his experiences as a teenager? Of course there were likely to be other causes. Life is seldom simple. And of course, I'll say again, as the judge said, none of this excuses his outbursts of anger. What makes this all so troubling is that on Thursday we were already hearing of reactions to the terror attacks. Hate mail received at Mosques just hours after the attack. Abuse of Muslim mums taking children to and from school. Here in Luton and around the nation. My question is this. What will the impact of that hatred and discrimination be one of two decades on? If the response to this atrocity is the cause of the cycle of vengeance turning again, then we must do all we can to stop that cycle. And as I reflect on the proximity of my life to Masood four decades ago i am prompted to ask two questions. Is there anything I could have done differently if I'd had the benefit of a time machine? And with that in mind, what can I do now to negate hate and discrimination? Once again terror has visited our nation. Four were killed in Westminster yesterday, one of them a policeman, and one the terrorist. Many were injured, from many nations, several are in a critical condition. Eight have already been arrested, and the killer, now named as Khalid Masood seems to be known to the police. Much more will become known for sure. The police are treating it as "Islamic related terror." Isis are now claiming responsibility. What Khalid Masood's relation if any to them is we don't yet know. Let's be clear, it is arguably possible to say the terror is "Islamic related", but it is not Islamic. Major bodies of Muslims have condemned what happened - the Muslim Council of Britain and the Islamic Society of Britain among them. Luton's two council of Mosques have a statement out as I knew they would. I have heard nothing but grief, anger at what has happened, solidarity with the police, and total condemnation from Muslims. "What the terrorist would like to happen is for us to fall apart and start blaming groups of people, to say that in some way this is Muslim or Islam as a whole." In refusing to respond to hate with more hate, but calling consistently for people to come together, he denies terror it's impetus to turn the wheel of vengeance one more time, so ramping up the conflict. Sadly, we are also encountering the worst of people. Blame for the terror incident yesterday is already clear for many, and it lies with a religion, not a person. Yesterday several Luton Mosques were saying they'd already received hate mail. This morning there were reports of abuse to women taking children to school. More poison in the system. A lot of that is as always now on social media. Stephen Lennon, aka "Tommy Robinson", founder of the English Defence League (EDL) and now freelance stirrer, managed to get to the scene of the atrocity in double quick time yesterday - just as he did after the killing of Lee Rigby in Woolwich in 2013. Online video and twitter outpourings from him as well as many on social media have sought to stir the divisions, repeating their narrative of a clash between Islam and the Christian West. Nigel Farage, former UKIP leader was clear where he placed the blame: "Frankly, if you open your door to uncontrolled immigration from Middle Eastern countries, you are inviting in terrorism." The US president managed to restrain himself from much comment though he did lay into London Mayor Sadiq Kahn. At one point last evening it was rumoured the terrorist was Abu Izzadeen, well known member of al-Muhajiroun and associate of extremist preacher Anjem Choudary. (Rumours on social media then seemed to solidify on Channel 4 news, though by the end of the broadcast they were retreating on learning he was in prison.) Lennon has extensive form with both Choudary and especially his Luton group, led by Sayful Islam, so he was quick to cotton on to this and talk up how well known he was to the authorities, and his links in the Muslim community. When Izzadeen was removed from the frame he barely stopped. Guilt by association. I can really only adequately speak for Luton on this, but for the past eight years, since EDL formed in response to protest by al-Muhajiroun against an army regiment's homecoming parade, the Luton Muslim community have done all they could to marginalise their influence. I have been participant and observer to that activity. The fact that is was only 2016 they were brought to trial and imprisoned for recruitment for ISIS lies with the police and Home Officer. The Archbishop of Canterbury in the House of Lords this morning helped us frame the conflict differently. (Link). He called us to British values that come from a narrative that has been within our society for almost 2000 years. “That speaks of – at this time of year as we look forward to Holy Week and Easter – of a God who stands with the suffering, and brings justice, and whose resurrection has given to believer and unbeliever the sense that where we do what is right; where we behave properly; where that generosity and extraordinary sense of duty that leads people to treat a terrorist is shown; where that bravery of someone like PC Keith Palmer is demonstrated, that there is a victory for what is right and good; over what is evil, despairing and bad. " i trust we can resist the push to frame the conflict as between Islam and Christianity, but rather a peaceful vision for society supported by all of good will, Christian, Muslim, other faith or no faith, versus that of the terrorist, described by the Archbishop as a "perverted, nihilistic, despairing view of objectives of what life is about, of what society is about, that could only be fulfilled by death and destruction." The challenge of the Christmas story as we face an uncertain future. Warm Greetings this Christmas, and Best Wishes for a Good New Year! Detail from Magnificat Window of St Marys Luton. The Magnificat in Luke 1.46-55 records Mary, mother of Jesus song on hearing she would bear a son who would be the Saviour of the world. "He has brought down rulers from their thrones, but has lifted up the humble. He has filled the hungry with good things, but has sent the rich away empty." In her song Mary anticipates the heart of the Christmas story. Looking back over 2016 it's been a year of both challenges and steps forward locally, but also one where despite all our good work together, national and world events have had a big impact on our life as a town. Terrorist atrocities in Europe and beyond; extremists turning up either planned or without warning and spewing their hate on our streets; the continued erosion of so many services in the seemingly never ending austerity, and more lives messed with – these are things we've learned to deal with, much as we hate it. But the impact of the Brexit vote, and the election of Donald Trump as US president has been a rise in hate crime and incidents, and to provoke fear of future policies that will discriminate against many. These originate way beyond our town, it's hard to know what we can do. With so much going on, so many uncertainties, so much negative I have found great strength this year in the themes that stand out so strong in the midst of the Christmas narrative. The promise to the Prophet Isaiah of the birth of one named the Prince of Peace (1). Mary's beautiful yet subversive song on hearing she would bear a son, in which she proclaimed him as one who would bring down mighty rulers, lift up the humble and bring justice to earth (2). The announcement by the angels of peace on earth and goodwill to men (3). The arrival of wise men from the east who came to worship a true king born in poverty rather than the cruel Herod they greeted in Jerusalem (4). And the birth of a child, born in humble & chaotic circumstances who I worship as God, and many of you honour as a Prophet, whose life would change the world. The narrative of so many in our world at this time, and especially the extremists who've so plagued our lives since the turn of the millennium, is that the Muslim world and the Christian/ liberal democracies of the West are destined to a clash of cultures (5) it's worrying to see so many in the new Trump Administration as card carrying believers in that as the big picture of 21st Century International Relations. We've seen extremists trying to make that the defining story of Luton. But it's a joy to stand with my Christian and Muslim friends at the end of 2016 and say together that with the strong support of friends of other faiths, our local government, police and our wider community we are showing there is another way. That's the Luton Story! And that's the story we have for the world! I trust the Christmas narrative of peace, justice and hope lifts your heart and energises you in some way over this season, whether you are a Christian, follow another faith, or are a person of no faith. It's a pleasure to work with you all! Peace on Earth, and goodwill to all! (5) The heart of Samuel Huntingdons’s thesis of 2004 of a Clash of Civilisations. "Integration" .... or "Hospitality, Generosity and Welcome"
What I'll boldly say is this. I'm not sure how useful it will be. I have no doubt it'll be used to legitimise the government's next stages of their work in extremism. That might be useful to them but in the big scheme of things I don't hold out much hope for the much needed changes based on what I read. In the Casey Review. "The catalyst for attempting to codify our shared national values—what the Government have called “fundamental British values”—is the threat of violent extremism in our country and, to a lesser extent, questions about immigration and integration, inequality and our role in the world. But values built on feelings of threat and fear can lead us down a dangerous path. Practices and loyalties that are not grounded in values of hospitality, generosity and welcome lead to a turning inward that strangles the hope of the common good." Hospitality, generosity, welcome. Roted in Jesus' teaching on loving your neighbour and demonstrated in the story of the Good Samaritan. "It reinforces a Christian hope of our values: those of a generous and hospitable society rooted in history; committed to the common good and solidarity in the present; creative, entrepreneurial, courageous, sustainable in our internal and external relations; and values that are a resilient steward of the hopes and joys of future generations in our country and around the world — hopes that are not exclusive, but for all. That is what our values have been when they are at their best." The Casey review gives one view of what might be going wrong. It has a long list of what "immigrants" need to do, what government might do. They might be helpful. But I very much doubt that they will sort the fundamental problem. I suggest the answer might be with us. All of us. Hospitality and welcome start with the one who is at home. Or the one who has the upper hand. When I go to a new place the welcome I receive gives me an idea of what I can expect in that place. A good welcome makes me feel at home. Hospitality gives me the means to live as if I were a member of the family. It comes with privilege but also responsibility, just as being family does. My host wants to be generous. But I do have responsibilities. Being new means I don't know everything, I get things wrong. It's then that generosity of spirit plays an especially important part. To be honest listening to many peoples migration stories arrival in the UK was often not great. Welcome was often lacking. And the lack of generosity of spirit often continues. There's a fair bit of putting things right to do folks. But in my experience generosity of spirit and solidarity expressed now in the face of some of the racism and hatred we find in our world go a long way to putting things right. That's certainly our experience in the Luton story of facing down far right extremism over recent years. "Our response to those who seek to threaten and undermine our values cannot simply be grounded in a defensive or preventative mind set. To draw back into ourselves. To look after our own. As part of the counter-radicalisation policy, ‘Prevent’ may be important. But if we spend all of our energy preventing bad ideologies — whether religious or political — I fear that we will neglect the far more transformative response required to build a convincing vision for our national life. In short, we need a more beautiful and better common narrative that shapes and inspires us with a common purpose; a vaulting national ambition, not a sense of division and antagonism, both domestically and internationally. We need a narrative that speaks to the world of bright hope and not mere optimism — let alone simple self-interest. That will enable us to play a powerful, hopeful and confident role in the world, resisting the turn inward that will leave us alone in the darkness, despairing and vulnerable." A vision of this kind will promote cohesion around the common good. Integration then goes two ways. And instead of being tempted to point the finger, at this government or any other, or "immigrants" or "Muslims", I suggest we all seek to play our part. Our future together as a nation depends on it. I posted the first part of this letter yesterday, challenging the church to give a lead in challenging the rise of hatred towards various groups since the Presidential election concluded. You can find it here. I now want to focus on anti-Muslim hatred, one of its sources and my particular relationship to that, and my building strong working relationships with the Muslim community. Most of my recent work has been in relation to the Muslim community, and I want to address and challenge one source of anti-Muslim rhetoric that has been fueling division in our nations. That was the reason I agreed to write for 30 Days. The voice, the ideas, the writings, the videos of significant numbers of Christian leaders, many in the USA but to be found everywhere, so often finds its way into the arguments of the far right and Islamophobes. I find it deeply upsetting to hear the name of Christ identified with those ugly words and evil actions. To see Christian leaders being quoted by leading voices on the far right, and even at times those same leaders endorsing far right activity, makes me very, very sad. To find the name of Jesus Christ, whose self-sacrificing love was poured out for all, associated with hatred is unfathomable. To see Christian leaders labelled islamophobes, extremist hate preachers, saddens me deeply. Yet I understand why it's done. I'm not accusing you who are mainstream Evangelical Christian leaders of hatred. I know most of you speak from a passion for your faith, a deeply faithful view of the scripture, and a desire to see those who are not Christian discover the love of Christ. I understand, admire and share that. Yet some of you allow that passion for your Christian faith to express itself in a view of Islam and Muslims that is deeply unloving. I won't go here into the intricacies of “Is the Biblical God the same as Allah?” or examine the way Muslims come to faith in Christ. All important but they don't actually matter when we are addressing hatred. In a nutshell, when Christians say we love Muslims it is surely reasonable to expect what we say sounds like love for Muslims, and perhaps more importantly for it to be associated with actions that show it. And that's the problem. It so often doesn't. And when people of evil intent pick up those Christian voices they have ready fuel for their fires of hateful bigoted words, and worse, their actions. The preaching of love somehow finds itself associated with hatred. Some will say I'm being naïve in my approach to Christian leaders. I know I’m not. Christian leaders may question my credentials for making these charges. For a long time yours was my world. Even many who work with me now will not know that for some 25 years, until 2007, I was a missionary, working with Youth with a Mission (YWAM). YWAM is an international evangelical and charismatic missionary organisation working in most places around the world, including the Muslim world. For nearly a decade I gave international leadership to some areas of training, including language, culture and intercultural relations. I stepped down from that leadership role in 2002-3 to focus on peacemaking and reconciliation, a journey that led to my leaving the mission a few years later. There is much I could say of that journey, some for another time perhaps, but for now my focus is primarily the voice of Christian leaders towards Muslims. I know about it because it was my world. I know your love and commitment to sharing the love of Christ, but I know also how your voice can so easily sound very different. I’ve always been sensitive to the mismatch that is evident too often between the intention of the messenger and the perception of the hearer. Voices in the Christian and missionary community often rang alarm bells in my head, but I sought to do all I could toward changing that from within. For a while I was convinced change could happen. For several years in the mid to late 1990’s I supported and occasionally participated in a project that sought to help Christians rethink their relationship with the Muslim World. Many YWAMers participated in the walk and it profoundly impacted some. That experience and others like it were a key part of my decision to refocus my work. I saw the impact peacemaking could have in demonstrating Christian faith. The journey of reconciliation changed me. I saw a different way of relating to Muslims. That was true for many. I had hope that the way of reconciliation could change the approach many evangelical and charismatic Christians had to Muslims. Sadly the attack on the Twin Towers on 9.11 changed all that. The image of those planes driving their way into the Twin Towers seared itself in the American psyche in the days after that fateful September day. It was not long before strident angry attitudes towards the Muslim world became more dominant. Yet personally my only desire the day after those horrible events was to go with friends for a meal in Bury Park, Luton, surrounded by Muslims, and treat them like the friends I knew them to be. Those same attacks simply underlined for me, and friends on the journey with me, the need for making peace in the name of Christ. However I often felt very out of place. Too often I found that the simple way of peace at the heart of the teaching of Jesus was lost in the clamour that was driven by fear and that so easily looked like and indeed became revenge. As my journey continued it opened up new tensions. By early 2003 with a new direction, as well as being increasingly uneasy at the views of those around me, I knew I had to step down from leadership which I did finally in early 2003. My decision was confirmed for me at my last leadership team meeting. I mentioned to a minibus full of leaders that I'd been on the million person “Stop the War” march in London against the Iraq war. The silence was deafening. I want to underline how in many ways it saddens me to write like this about this journey. Among those reading this will be YWAM leaders. As difficult as I found your voice to be on some matters, I had and still have dear friends among you, and I owe you much. I spent much of my working life with you. I grew up in Christian ministry with you. I was believed in, encouraged, and given a wealth of opportunity. There were challenges but that would be true anywhere. On leaving I made a commitment to myself and close friends not to speak ill of the mission or its leaders. That still stands and I believe I’ve been true to that commitment. Many who know me now won’t know of my past simplybecause I've often not spoken of it because I don’t want to be associated with criticism of you. I speak now because like so many other American evangelicals I want to ask you to be a voice for the vulnerable in your society at this time. Many of you will tell me that what we are seeing is the predictable outworking of the clash of civilisations between the Islamic World and the Christian West that Samuel Huntingdon predicted. To be honest at times it has seemed to me that Huntingdon’s thesis was not a theory but rather the script. I am very familiar with the idea. These past ten years I have worked in a town where two extremes have sought to make it the script to the drama they are enacting. On the one side a small group of al-Muhajiroun extremists from the Muslim community connected with extremist preacher Anjem Choudary. On the other the far right English Defence League, founded by Luton resident Tommy Robinson in 2009, who have taken their street movement with all its associated hatred and evil around the UK. As Christian and Muslim community leaders in the face of the emerging conflict we committed in 2009 to not to allow ourselves to be pulled apart by the extremes but to hold the centre. We have defied the narrative of inevitable conflict and created our own story largely around being good neighbours and simple acts of kindness. The journey has deeply impacted the way I think about life and my faith. That is the basis for what I write in 30 Days. I've seen how working like that has broken down barriers, and I can be passionate about my faith, share it freely with Muslims, even long for them to know it themselves – and still be at the forefront of challenging hatred towards them! In a day when the evils of hatred and bigotry are proving so destructive, it is time for Church leaders and leaders in mission to live and work in ways that bring peace to our conflicted communities. It is time for the voice of Christian leaders to clear up the ambiguity that is there in their statements about Islam and let love and grace look just like love and grace. Our testimony is the teaching of Jesus on peace works! For us in the UK, for the sake of our nation, and in obedience to our faith, we must walk forward into an unknown future. It may be that we personally wouldn't choose to live along with people we profoundly disagree with. However whatever we think and whatever future policy around immigration it’s a reality we cannot change. We must confront the evils present on the fringes of the #Brexit campaign, and champion a truly just and fair inclusive multicultural society. As we do so integration and all the anxieties we face will be dealt with. My American friends, especially Christians, I challenge you most strongly to confront the evils of intolerance, hatred, bigotry that has emerged from the Trump presidential campaign, and which now threatens to settle as the norm in your nation. As Christians you have a faith that can disarm the fear that drives hatred. You must. Hatred, Fear and bigotry are not worthy of being associated with the Prince of Peace. 1 John tells us that perfect love casts out fear. I challenge you to walk in that, and allow enemies to become friends, however much you disagree with them. We are all the "protected species", Paul. "The fact of the matter is, it's one rule of law for Muslims, the protected species in this country, and another for British people." These words, commonly heard from the far right, were spoken yesterday by Paul Golding, leader of Britain First after the conviction of his co- leader Jayda Fransen for religiously aggravated harassment. Golding and Fransen claim to speak with a Christian voice. Asked yesterday if she was acting Christianly while in Bury Park that day Fransen said yes. I've got news for you, Jayda and Paul. The Bible tells us that we all deserve justice. And we all owe it to one another. God calls that good. in God's eyes we are all the protected species. Even the Muslim woman in a hijab. Even if she's wearing a burqa. No one deserves the abuse you were guilty if on that day. So please don't claim what you did was Christian. Whatever your political or religious beliefs it is totally unacceptable to go up to a young woman with her children and abuse her. A judge at Luton magistrates court just found Jayda Fransen, deputy leader of Britain First, guilty of religiously aggravated harassment and of wearing a Britain First uniform during a so called "Christian Patrol" in Luton on January 23rd this year. She was fined a total of £1920.00 including costs for both counts. The judge told Ms Fransen that her behaviour was not acceptable, and in recognising the trauma brought to that young woman and her children said there was little she could do to put things right other than impose a restraining order on harassment of the victim through further use of video footage of the event. She said that Sumayya Sharpe was a credible witness and showed great compassion for her and the way she was treated. Ms Sharpe had expressed in her evidence upset that she lost her cool towards the end of the encounter, but that it was a result of a long run in period during which she'd been targeted by BF. To be fair Ms Fransen also said in court that she got wound up during the incident, though this was not the way she has presented it in previous videos talking of the incident. I've written about the incident in several posts on this site and what we did in response. 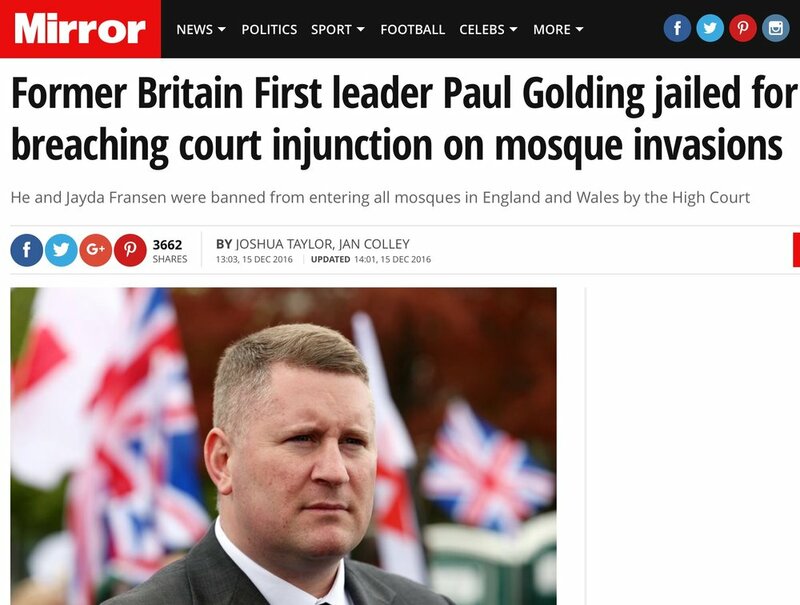 Paul,Golding pleaded guilty in Late July to the same charge of wearing political uniform. The judge spoke of the way several witnesses, including both the Roman Catholic priest and Anglican Vicar of Bury Park, identified it as a uniform. She said the effect of the uniform was to cause alarm on those seeing the 20 or do BF activists marching brandishing crosses through Bury Park. Well this might just be the last we hear of BF in Luton for a while. We will see. It's a good verdict! On July 20 a group of Christians and Muslims in Luton launched FACES - Faiths Against Child Sexual Exploitation. It was the first milestone in a journey where a group of us had come together to engage with one of the great scourges of our society, the sexual abuse of children and young people by men, women, and sometimes their fellow youth. Somehow the story has got around that our faiths are soft on such evil. We'd discovered that we each share a passion to ensure that individually and together we oppose all assaults on the precious young ones in our community. The following is a presentation given by Tanvir Mounir, Secretary of Luton Central Mosque, and myself, Peter Adams, director of the St Marys Centre for Peace and Reconciliation. Peter and I have been given the task of speaking to you all about how we respond to Child Sexual Exploitation -as people of Faith, specifically as Muslim and Christians. It is a difficult subject to speak about, and it's human nature to want to avoid talking about things which give us pain-but we must talk about it. This past few months as well’ve been meeting to talk over this issue we have found we can talk honestly together, that we share one mind on this and that we are determined to stand together to oppose it. Our hope today is that you too will be able to join us in that, so that even the most horrible and divisive issues we face in our nation can be dealt with together. Child sexual exploitation – people doing horrible things to children and young people. Its not a Muslim thing. Not a Christian thing. Not a Hindu thing or a Jewish thing or a Sikh thing or a Buddhist thing. It's not a secularist or humanist thing. Let's be very clear. It's a human thing. Something done by men - and women, and sometimes young people themselves - who've lost touch with their shared humanity, their responsibility as adults. People who occasionally seek to hide behind their faith, to lurk in the shadows of places of worship and conspire, who use their faith to cloud and obscure and in seek to justify it from their faith. Peter is absolutely right, It's a human problem. A human problem that people of every nation, tribe, culture, faith can be drawn into. Sometimes those people use the traditions of their culture or the structures of their faith to promote it, or legitimise it. They are wrong. There is no honest interpretation of either of our faiths that endorses this behaviour. As a Christian I need to be clear in my denunciation of all forms of Child sexual exploitation as a Christian, even when it has found places to thrive in and around the the church –through pastoral involvement with children, in the context of a choir, in church run children's homes and the like. I'm deeply saddened by the fact that this past week in the papers I read of two senior church leaders, bishops, who are convicted of, or strongly implicated in sexual exploitation of young people. As a Muslim, I too am unequivocal in my condemnation of Child Sexual Exploitation. It's sad that these things need to be said, it should be a given, but awful things have been done in our towns, from Rotherham and Rochdale to Oxford and Telford, by Muslim men. Like Peter, I too am disgusted and angry at their actions, and am determined to do something. I know that I'm not alone. And although their actions are in no way a reflection of the teachings of our faith, it is a sense of shame that has devastated my community. The behaviour of those men was grotesque and inhuman. Thank you Tanvir. Thank you. We are united in saying that true faith condemns CSE. It offers no refuge. It takes seriously the terrible impact on young lives whoever they are, wherever they come from, whatever creed, ethnicity, gender, class they are from. I have seen tears in the eyes of my friends here as we have talked together over these months. We are determined that we will do all we can to highlight this evil that devastates lives. And that as people of faith we will reach out to the victims, the survivors, those whose lives have been violated by the horrors of it all, and speak hope and restoration. True faith also offers men and women a way out of sexual exploitation, to face up to what they have done, it gives them inner strength to resist the pull to abuse, and shows a different way of living. As faith leaders we want to show that our beliefs can and should be part of the solution, not part of the problem. We've brought you all here to today to ask you to support us in this work. This event today is our stake in the ground. We hope we have made our intentions to do something about this clear. But we cannot deal with this alone. We invite you today to join us in our opposition to any form of Child Sexual Exploitation that might become evident in our community. We will continue to speak out together, to make known our united opposition to it. All who are leaders in the Christian or Muslim community -- Imans, mosque leaders, church leaders, lay or ordained, please join us. We have started this journey as Christian and Muslim leaders but we now invite other faiths to join us. Members of community groups, public sector bodies, voluntary sector groups, individuals of faith or not, we need you too. More details soon, but it basically will ban Paul Golding and Jayda Fransen, Britain First leadership, and anyone they encourage to be there, from Bury Park, Luton. Nor can they publish material about Bury Park. They can only come to Luton with permission from police, and then only once every eight weeks, and they can't enter mosques in England and Wales, except by invitation. All for three years. I have no doubt that this will face a lot of analysis as it looks like it's a move against freedom if speech, but in reality it's a move to balance freedom of speech with freedom for people here to go about life without facing intimidation and abuse. They have had their opportunity to do freedom of speech in a civil way, on six occasions at least, and gave failed each time.